The best store signing I’ve ever done was in Perth, Western Australia. Ann and I spent two weeks in New Zealand and Australia, first doing conventions in Auckland and Wellington with Devin Grayson and Mark Waid, with a memorable and enjoyable trip from the one city to the other in between, a trip involving blackwater rafter, go-karting, dry luge, para-sailing, jet-skiing and the discovery that if anything anywhere went fast, if you’re with Mark Waid you have to stop and do it Right Now. Very good cons, a lovely country, friendly people, and we’ve taken one trip back since, to vacation in the Bay of Islands and Queenstown, and that’s not the last time we’ll go, either. And then Ann and I went to Australia, where the original plan had been to do a convention in Sydney, but the convention fell through and was rescheduled, so we wound up arranging store signings in Sydney, Melbourne and Perth. We also visited Ayers Rock (stunning, and we got to taste kangaroo and emu, but many, many flies) and took a side trip to Brisbane to visit Eddie Campbell, who had said come on out sure it’ll be great and then wound up delayed in England so we had a delightful barbecue with Eddie’s friends and prowled used bookstores for Australian editions of Nevil Shute. And Sydney’s gorgeous and parts of it look like the Blade Runner production designer’s idea of what New York would look like if New York was cool enough, and Melbourne was a treat, with the giant casino with the gargantuan gas jets that went off at odd intervals. And the signings were well-attended and friendly and enjoyable. We pointed out that we’d come here from the United States, so if going a hell of a long way stymied us, we wouldn’t have come in the first place. Which was true. But mainly, I wanted to see as much of Australia as I could get in. I mentioned Nevil Shute, who I’ve been a fan of since I stumbled on his work in college and who was a strong influence on Marvels, so for years I’d been reading about all these fascinating-sounding places, and sure, I knew it was decades later than what he’d described but I still wanted to see them. And I wish we’d had time to get to Cairns and Alice Springs and Adelaide and Tasmania, but in the meantime I wasn’t going to pass up the chance to see Perth. And I’ve got to say, Perth is lovely. A pretty green gem on the edge of the Indian Ocean, with the Swan River snaking through it in arcs, very muck a mixture of British heritage and Indian proximity, making for a distinct and charming combination. 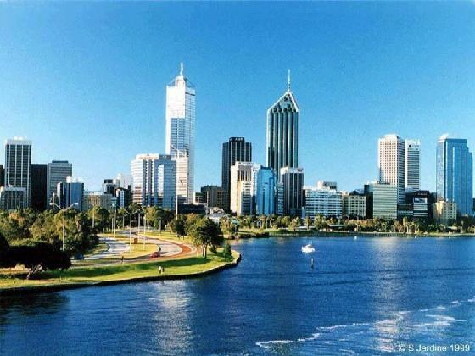 I definitely want to get back someday, and not only see more of Perth, and see more of Western Australia, too. The point at which I realized it wasn’t going to be an ordinary signing was when we were at breakfast with the owner of the store we’d be signing at, and a reporter who was there to interview me for a local radio show, and we were up on a hill overlooking the city in a spacious and comfortable room with spectacular view windows (my memory says the restaurant was a converted colonial-era mansion of some sort), just chatting and enjoying good food, when the store owner’s mobile phone rang. It seemed there was a line, and it was in danger of blocking the entrances to other nearby stores. It was 9:30 in the morning. The signing was going to start at either 4:30 or 5:30 in the afternoon. And there’s a line? It turned out I was the first American comics creator to visit Western Australia and do a signing. Unless you count Neil Gaiman, I was told, who came for a science fiction convention, so that was books, not comics, and didn’t really count. All those people who went to Sydney, or Melbourne, and then went back home…boy, were they missing out. It was like being a rock star. When we did get to the store, which was below street level, the line wound round and about through the stacks in the store, out the door, up the stairs, around the corner and off far enough that I wasn’t sure where the end of it was. I think every comics fan in Western Australia had turned up. The store had built be a signing booth, with Astro City displays, including a 3-D re-creation of the Astro City logo, complete with electron-ringed rocket. And I chatted with people and signed for hours, and the line slowly snaked its way through, but it felt like there’d be no end to it. I’m sure that gets exhausting for people who get that sort of thing all the time, but I’d never had anything like it at that point, and I didn’t have anything remotely like it again until a couple of years later when I was at a Heroes Con in Charlotte, North Carolina and was signing books and looked up for a moment and realized the line went on forever and had an, “Um, guys, Neil’s over there” moment, before realizing that, well, doing three monthly books for Marvel on top of Astro City did stack up the number of books to be signed as well as the audience that wanted signatures. But even that, and the well-attended signings I’ve done since, were anything like that day in Perth. The other thing I remember from Perth was the next morning, scuttling around in the rain, trying to find a pharmacy open early enough for us to get a pregnancy test before our flight back to Sydney, because Ann was having morning sickness and we wanted to confirm her guess. And yes, it turned out she was pregnant with our first child, Sydney.